I love macarons. About 12 years ago, I tried my hand at making them. I used a recipe that was touted as being from the Queen of French macarons, Lauderee. I painstakingly followed the recipe and they came out like pancakes, with no pied, or foot and a grainy taste. Making them was put on the back burner since there had to be some secret that wasn't spelled out in the article. Since I love them so, I wanted to try making them again and did some research. I bought a book just on macarons and then after reading reviews of it on Amazon, I decided not to use it. 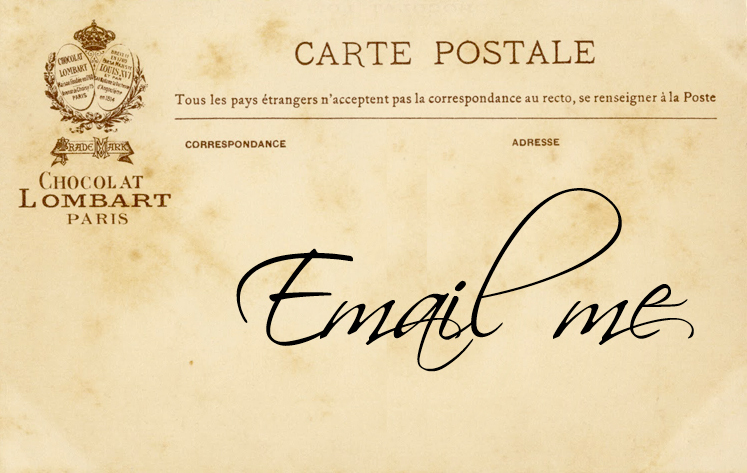 My journey took me to Tartlette's blog and I devoured her article "Demystifying Macarons." She gives a full tutorial, which I followed almost to a T. I say almost because she calls for grinding your own almonds and I had already bought almond flour/meal, so I used that. They came out perfectly! They have the required pied, height and a nice glossy crust. Since Valentines' Day is approaching, I made some of them in a heart shape and the rest I made round. I filled them with 2 different fillings. One is a simple dark chocolate raspberry ganache, and the other is a white chocolate raspberry ganache. Both are equally delicious. 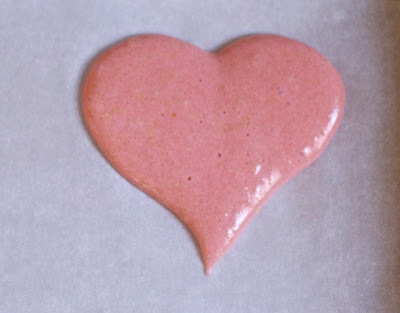 The heart shapes are charming and easy to make, with the right movement of the pastry bag. 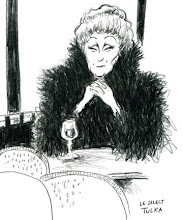 I have tasted many a macaron all over Paris throughout the years. 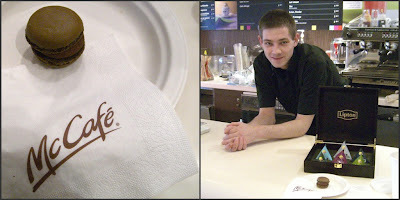 Recently I couldn't resist popping in when I saw McDonalds had a McCafe within their fast food venue right in the heart of Paris. I had to try one of their chocolate macarons, just out of curiosity. It was OK...dense with no depth of flavor.... and if I didn't know of the rich and delicate taste of an expertly made macaron, I may have even liked it...well, sort of. A few months ago after a full course meal with dessert at a favorite restaurant in Paris, the waiter brought my friends and I a plate of sweet delicacies. Oh, la, la...meringues, financiers and macarons. We all somehow found room. I, of course, had the macaron....the chocolate one! Have I mentioned I love macarons? Tartlette (thank you!) has such a wonderful article with a tutorial on making the macarons, that I will link to that article here. Just look for the a small box that has a "Desserts" magazine cover to the right on the page underneath archives and click on it. It is in pdf format. i wanted to say your prettiest post ever, but thats a lie, they ALL are fantastic! but this is extra special! love love love is in the air, oolala i love you hearts! You should be most proud of yourself...the heart is spectacular! 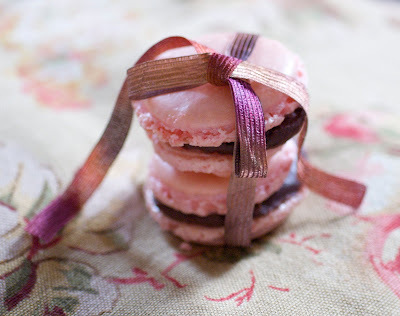 i want to bake macarons... but am intimidated...i think that with this post & helen's tutorial i will give it a try! hope to go back to paris soon. 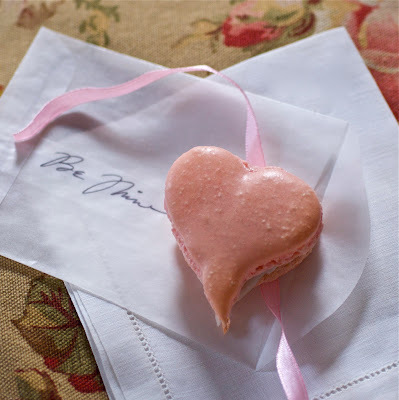 love your heart shaped macarons...little gems! 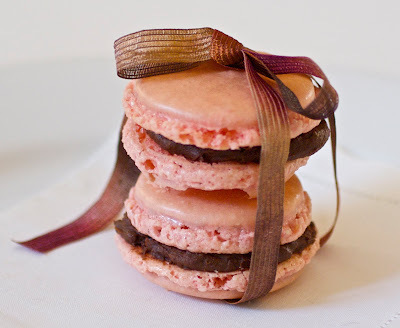 you tinted th e macaroons a beautiful shade of pink ever. I LOVE IT! n the heart shape is delightful...ive never seen a heart shaped macaroon b4. Those are just about the prettiest things I have ever seen! And to think they are macarons too! Love your flavors and the way you have wrapped them up! Kudos! As always, so very beautiful and inspiring Diane. Oh my, I love macarons and dream about the day I get back to Laduree to buy more. In the meantime, you've given me the courage to try making them. 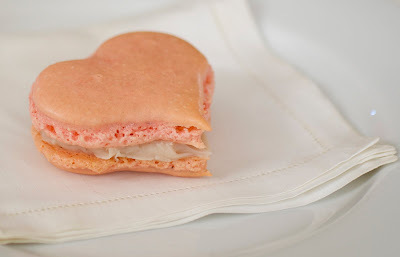 Your Valentine macaron is perfectly beautiful. Thanks, all! These aren't as good as Lauderee, but not many are! I'm taking it all step by step. Weather also seems to be a factor. Such temperamental devils, they are! Monique, the Lauderee paraphernalia is actually from a window in Paris...such eye candy! Thanks Zurin for the substitution...I hope to give your cookies a try. Linda and Cathy, I hope you get back soon! Lori...I was actually surprised when I saw the pied! I rapped the pan on the counter (that gets the air out for the pied to form) and aged the eggs. Things I hadn't done previously. Good luck, if you try...let us know how they come out. These macarons are works of art. Love your photos too. Gorgeous! I know that they are delicious too. I have yet to attempt making macarons. I will have to venture forth...you have provided all that I need.